Few things captivate the imagination of a child like the thought of a shark's fin piercing the top of otherwise perfectly smooth water. The lone hint of the merciless and powerful creature swimming swiftly and gracefully just below the surface. I can clearly remember swimming just like that in the pool hands perched in that distinct fin like triangle on the back of my head going round and round my parents legs ready to explode out of the water. Most crafts aren't great for the water, but there are plenty to add that extra dollop of sharktastic fun to an otherwise dreary day stuck in the house. So whether you are making a shark mask to run around with or making shark crafts that you can put on the wall or your shelf, you are sure to have as much fun as a great white chasing down a barracuda. Here are many Shark Crafts projects, activities, and ideas for you and your kids. Find out about Arts and Crafts Projects with Sharks following these crafts instructions, directions, and activities for children. 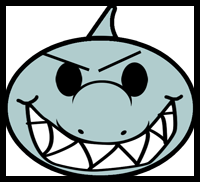 To make the above paper shark mask, just print out the following paper shark mask template and then print out and follow directions. Clothespin Sharks - Here is a fun craft that includes clothespins, painting, and gluing....the outcome is an adorable shark. Fun Sun Shark Visors Craft for Kids - - Make a cute shade in a sea shape to cool your head on a sunny day. How to Fold Paper Origami Scary Sharks - - Fold an origami shark in about 2 minutes. Take a break and watch jaws. Oh, the paper makes the shard look like it actually has scales or whatever sharks have. Keep Away From The Shark Crayola Craft for Kids - Play an outside bag-toss game on a chalk-decorated sea! Make your game as easy or difficult as you like. Make a Shark Totem Pole - - Each pole tells a story about a person or family and their relationship to these animals. Monster, Lions, and Shark Mittens - On chilly days, slip kids' hands into mittens you've decorated to look like ferocious beasts. Try a pair of fire-breathing dragons for maximum toastiness. If it's bitingly cold, however, our shark works best. Lion mittens are especially good when the wind roars. To create them, simply sew features cut from felt to fleece mittens. Buttons and embroidery will complete the face. Ocean Diorama Crafts Activity for Kids - Create your own ocean scene in a box. Just print out sharks and whales, draw some seaweed, corals, and your favorite fish. Paste, color, cut, hang them in a decorated box, and enjoy the ocean. Ocean Locomotion - - Make a Killer Whale and Shark Spinners.You will need scissors, glue and a pencil or long straw to make this spinner. Paper Plate Shark Craft - Use a paper plate, construction paper, scissors, and paste to make this awesome shark eating a fish with his huge, sharp teeth. Pop Up Shark Greeting Card Arts and Crafts Activity for Kids - Summer is here and "Jaws" is playing on the reruns. Make your own shark pop up for summer fun. Wouldn't this be cool to replicate in a large size? 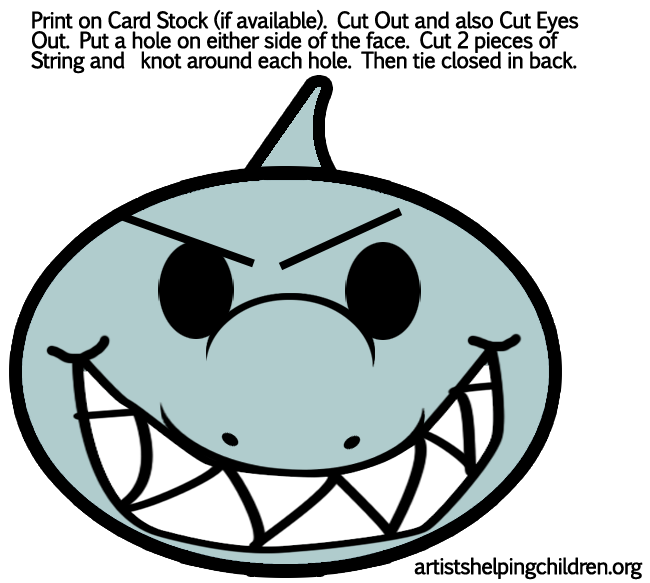 Pop-Up Card - Shark - - Make your own shark pop-up card with your face inside. Scary Shark Puppet Craft Ideas- To use the shark puppet, slide the teeth into the back of the shark so that they are hidden inside the box body. By pushing on the inner box you will cause the teeth to emerge from the mouth of the shark with a surprising show of ferocity. Yikes! Shark Can Kozie - Make a shark out of a soda / beer can Kozie, some craft foam, and googley eyes. Shark Chasing A Boat- Imagine a sailor at sea, looking for a safe port. The seas are rough and a hungry shark is following close behind!! What happens next? Use your imagination and anything is possible! Shark Craft - This shark craft doesn’t take very long to do- it took a while to draw the shark (Thanks Mom!) but actually doing the project only took a few minutes. Shark and Bat Hoodie Costumes - - These hoodie costumes are perfect for kids who love "scary" animals, such as sharks and bats. Shark Construction - Let’s just say that a shark headline doesn’t go unnoticed! Shark Jigsaw - - Store the jigsaw in a box or bag with the small image below to help your child recognise and complete the puzzle. Shark Fuse Bead Pattern - - A frightening shark for kids to make with your hama or perler beads. Shark Pop-Up Card - - Make a shark Pop-up Card. When you open the card, the toothy mouth opens! This is a very easy project and a lot of fun. Shark - Play an outside bag-toss game on a chalk-decorated sea! Make your game as easy or difficult as you like. Shark Attack Sock Puppet - There's no need to worry if this shark attacks its ocean buddies. Its soft fins and felt teeth won't do any damage. This shark isn't scary at all. It is a great way to entertain kids on the weekends. Shark Frenzy - - My son was really hesitant about having to have fin shaped hair, but he loved his shark fin so much, he wore it the whole time at the aquarium. Shark Hat - - Make a shark hat by following these instructions. Tesscar Aluminum Craft Free Shark Plans- (Parental Supervision) This free download will introduce you to the basics of working with aluminum cans. Toothpick Shark Sculpture Craft for Kids - You need patience and a steady hand to create this toothpick shark sculpture, but your kids' amazement is well worth the effort. Whale, Shark, and Dolphin Mobile Craft Make this interesting craft to decorate your room. Wooden Spoon Shark - This wooden spoon shark craft is original and very effective - it's sure to be a huge hit with the kids!